A lot of us had some extra free time on our hands over the Christmas holiday and spent it doing what we love to do -- play slots! Don't know about you, but I sure didn’t have a run of good luck like one Liberty Slots player did though! Raffella D from California won more than $100,000 over the Christmas break playing the classic Agent Cash slot game from WGS. Rafella’s increedible Christmas winning streak started with an $8500 win December 21st. She used that win to bankroll her slots play for the next few days. She got a big Christmas present on the 25th that added $11,000 to her account. Then she spun a $60,000 win on the 28th and another $21,000 on the 30th. Her luck continue as she won her way into the New Year with a final $32,000 win. 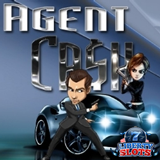 Agent Cash, known as “the ultimate spy slot game, has thirty pay-lines, Exploding Wild symbols, a free spin feature and two bonus games. “I've already received some of the winnings,” said the winner. “Getting these checks in the mail is like having a job, except you don't have to go to work! Thanks to Mark and Liberty Slots, they've been so great -- no issues with the payout, even over the holidays." "This was an incredible series of wins for Raffella!” said Liberty Slots manager Mark Ramirez. "It just goes to show that it can really pay off to keep playing when you get a win. You never know how far you can go!" Until the end of the month, Liberty Slots is giving players twenty free spins on another exclusive multi-line slot from WGS called Cash Cow -- a fifty pay-line game with multiple bonus features. Coupon code CS827HK is valid until January 31st, 2018.